as I practice looking and hearing each day. there is less room for me to play." So sweet. You are beautiful pregnant! I've always been so terrible about taking belly picks all along. I usually just get the whopper one at the very end! Seven more weeks for me! You look fantastic, Jessica! So exciting!!! I love that plum color. It looks great on you! You really are glowing! 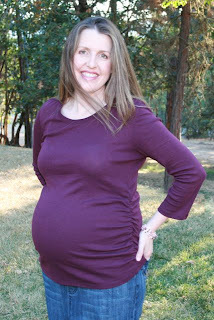 Keep sending maternity clothes recommendations our way: I'm gonna need them! You've got great style! Hello dear Jessica, you are so nice. I return from the sea with the class from my son. It was so nice with the 60 children we have nice weather. I kiss you and your family god bless you. What a beautiful picture of you and your little one. God bless! you are such a darling girl. that's right...you look like a girl still.